376. Antoine BORDELON Iwas likely born in 1732 but a baptismal record has not been located for him. His father does not appear with his mother in the January 1732 New Orleans census which would seem indicate that Anne (Roland) was pregnant with him by that date (and that his father, Gabriel, had died in late 1731). There are four children with Anne (Roland) in the January 1732 New Orleans Census. I believe that these are her three living children by Nicolas Sarrazin and her first child by Gabriel Laurent Thomas Bordelon - Nicolas. If this is accurate, it would confirm that Anne was pregnant with Antoine at the time of the census.1264 He appeared in the census in 1745 in (Pointe Coupée Parish), Louisiana, USA with his mother and step-father, Jean Stephan dit Roquancourt. Antoine was listed as age 12. Prior to his first marriage to Marie Anne Decuir in April 1759, the couple signed a marriage contract at Pointe Coupée. Antoine gave his wife 1000 livres and the bride's dowry consisted of 2511 livres, 5 sols including a sum of 1247 livres, 5 sols due her from the succession of her father. These were fairly substantial sums for such a young couple. 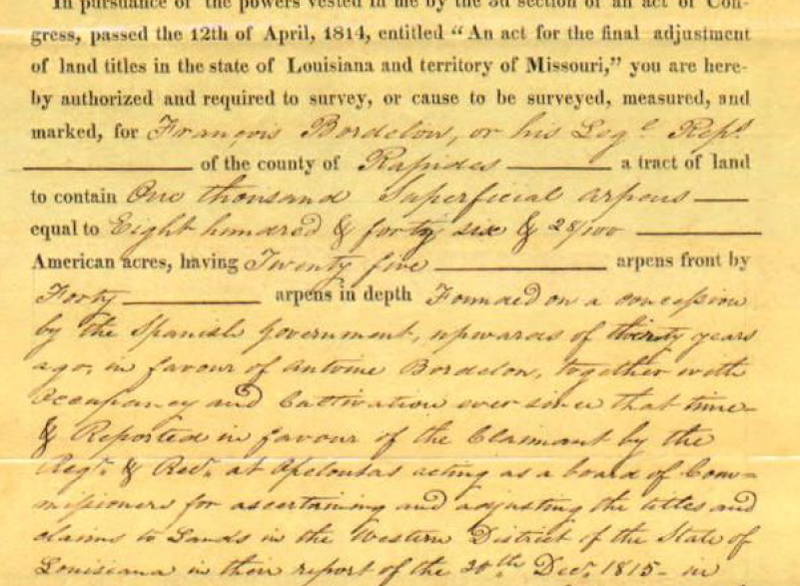 Antoine purchased three arpents of land from 'Sieur and Dame Pierre Le Doux' in (Pointe Coupée Parish), Louisiana, USA on 31 July 1767. NOTE: Marie Marguerite&apos;s family surname is believed to have originally been LEONARD although the surname appears to have slowly migrated to &apos;Frédéric Leonard&apos; or &apos;Frédéric dit(e) Leonard&apos; which becomes obvious in the records of Marie Marguerite LEONARD - above - who was often referred to by the surname FRÉDÉRIC dite LEONARD. ii. Victoire BORDELON was born about 1781 in (Pointe Coupée Parish), Louisiana, USA. She was baptized on 20 May 1781 in (Pointe Coupée Parish), Louisiana, USA.